D = fdesign.bandpass constructs a bandpass filter specification object D, applying default values for the properties Fstop1, Fpass1, Fpass2, Fstop2, Astop1, Apass, and Astop2 — one possible set of values you use to specify a bandpass filter. D = fdesign.bandpass(SPEC) constructs object D and sets its Specification property to SPEC. Entries in the SPEC represent various filter response features, such as the filter order, that govern the filter design. Valid entries for SPEC are shown below and used to define the bandpass filter. These entries are not case sensitive. Ap — amount of ripple allowed in the pass band. Also called Apass. Ast1 — attenuation in the first stop band in decibels (the default units). Also called Astop1. Ast2 — attenuation in the second stop band in decibels (the default units). Also called Astop2. In the specification 'N,Fst1,Fp1,Fp2,Fst2,C', you cannot specify constraints in both stopbands and the passband simultaneously. You can specify constraints in any one or two bands. Fp1 — frequency at the edge of the start of the pass band. Specified in normalized frequency units. Also called Fpass1. Fp2 — frequency at the edge of the end of the pass band. Specified in normalized frequency units. Also called Fpass2. Fst1 — frequency at the edge of the start of the first stop band. Specified in normalized frequency units. Also called Fstop1. Fst2 — frequency at the edge of the start of the second stop band. Specified in normalized frequency units. Also called Fstop2. N — filter order for FIR filters. Or both the numerator and denominator orders for IIR filters when na and nb are not provided. Regions between specification values like Fst1 and Fp1 are transition regions where the filter response is not explicitly defined. The filter design methods that apply to a bandpass filter specification object change depending on the Specification. Use designmethods to determine which design methods apply to an object and the Specification property value. D = fdesign.bandpass(spec,specvalue1,specvalue2,...) constructs an object D and sets its specifications at construction time. specvalue4,...specvalue4,specvalue5,specvalue6) constructs Dwith the default Specification property, using the values you provide as input arguments for specvalue1,specvalue2,specvalue3,specvalue4,specvalue4,specvalue5, specvalue6 and specvalue7. D = fdesign.bandpass(...,Fs) adds the argument Fs, specified in Hz to define the sampling frequency to use. In this case, all frequencies in the specifications are in Hz as well. 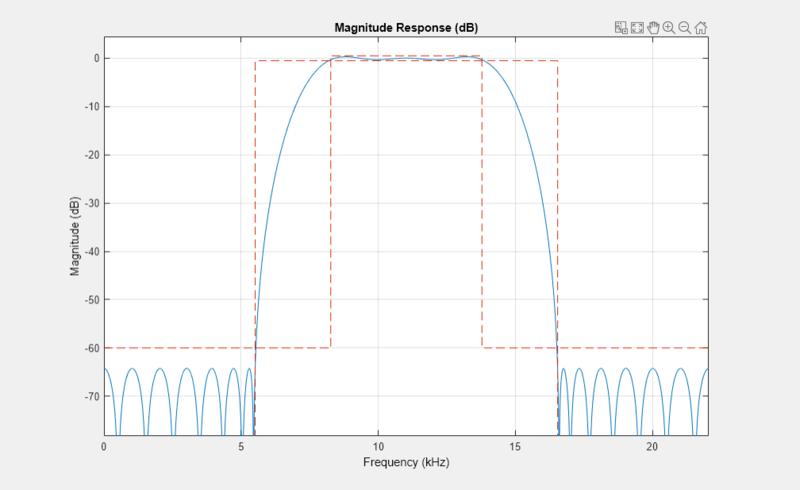 Filter a discrete-time signal with a bandpass filter. The signal is a sum of three discrete-time sinusoids, π/8, π/2, and 3π/4 rad/sample. 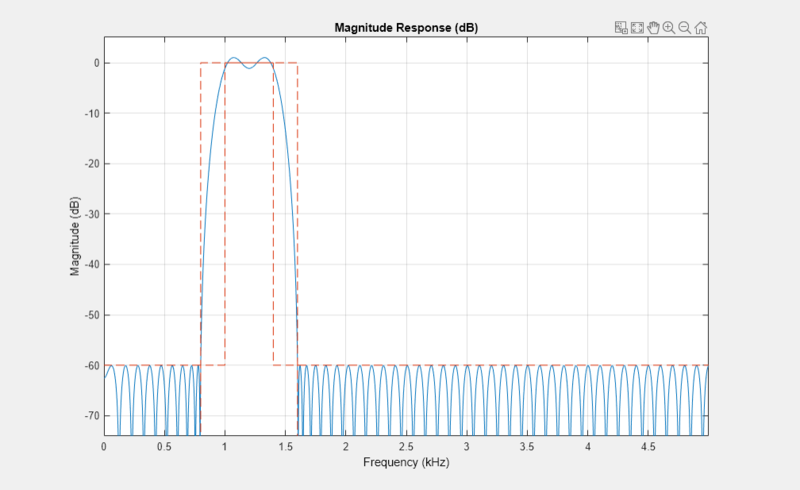 Design an FIR equiripple bandpass filter to remove the lowest and highest discrete-time sinusoids. View the frequency response of the filter. Apply the filter to the discrete-time signal. Plot the original and filtered signals in the frequency domain. Design an IIR Butterworth filter of order 10 with 3-dB frequencies of 1 and 1.2 kHz. The sample rate is 10 kHz. Visualize the frequency response of the filter. Design a constrained-band FIR equiripple filter of order 100 with a passband of [1, 1.4] kHz. 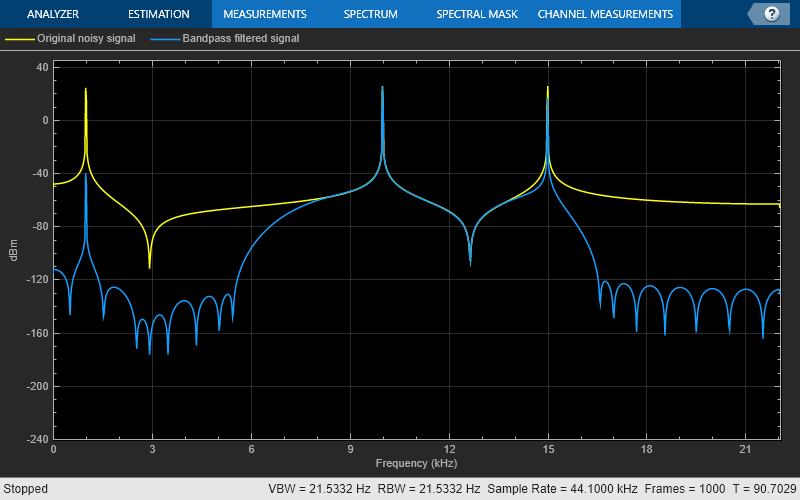 Both stopband attenuation values are constrained to 60 dB. The sample rate is 10 kHz. 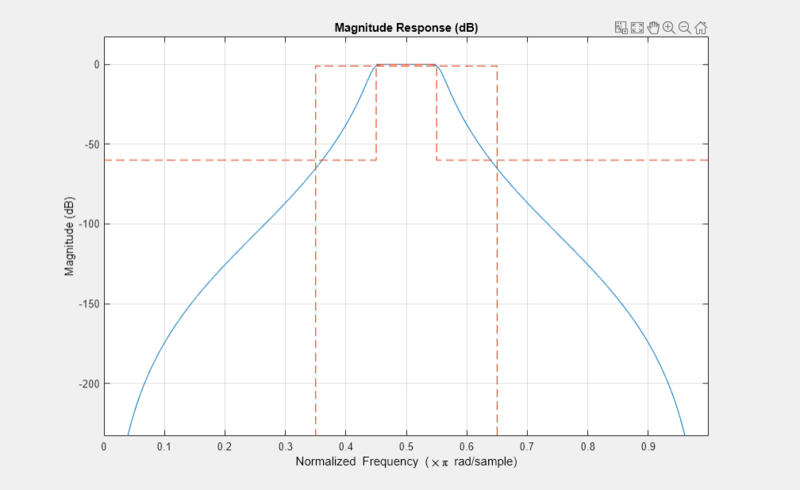 Visualize and measure the magnitude response of the filter. The passband ripple is slightly over 2 dB. Because the design constrains both stopbands, you cannot constrain the passband ripple.